I suppose I should set an official spoiler policy. G5 discussion is fine, as what we've seen won't fully reflect the end product. Season 8 and EQG leaks can only be discussed with great care. In this brand new one-hour special Sunset Shimmer is shocked when she discovers she’s been erased from her friends’ memories, leading her to search for the magic and the perpetrator who did such a dreadful deed. Check highlights for news related to official content after this, and threadmarks for stream and chat related posts after this. I've enjoyed Season 7. There's been a number of good episodes, though I think the show was as its best in Season 4. I don't have a GIF, but hello fellow PonyERA folk. Lupin here. First post on the forum! Pleasure to be here! I'm hoping that maybe I'll actually be more active here again? Anyway, Hi everybody! I would link a picture of a place called Starlight Cafe in Tomorrowland and say that even Disney World knows who best pony is but I’m on my phone and that’s really hard. That sums up why I don’t have an avatar either. Or why I won’t be posting much until I get back. Hmm, what is the perfect GIF to start everything on the right foot? ... I know! Nah, won't do that. Now's the time to party! 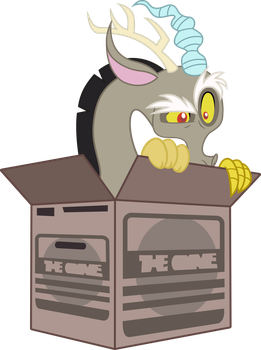 Hello, this is everyone's favourite changeling. I will continue to lurk as usual. So are we probably just going to be finishing out Season 7 discussion in here? Oh wait. Ponies are allowed here. Yes. We'll figure out season 8 later. Confound these ponies, they drive me to... well, watch toyetic children's cartoons and read a lot of fanfiction, mostly. So, how bout that Princess Celestia needing more screen time and proactive involvement in things? So, how bout that Princess Celesita needing more screen time and proactive involvement in things? Look, sorry, but I don't know a character like that. She(?) isn't in the OP. Is she related to Princess Celestia? I've never seen her do anything on the show, so I figured they might be family. Oh, her! I guess background characters do have a lot of fans, but even after "Slice of Life", you can't expect them to get a lot of screen time. Wait which year is this? The two-parter was written by Josh Haber, who has written or co-written the past 4 two-parters that have aired going all the way back to Cutie Re-Mark. His history has been a bit inconsistent, although I've personally been a very large fan of both Cutie Re-Mark and To Where and Back Again, and found the Starlight and Spike parts of the Crystalling to be pretty neat. At this point he more or less seems to be their epic story guy since McCarthy and Larson have both either moved on to do movies or have moved on altogether. His heading of the show back in season 6 has been fairly controversial, but all of that aside how does he fare here? Alright, I suppose. To start things off the episode had a bit of buildup to it, in a similar vein as Twilight's Kingdom. Unfortunately I feel like many of the stories introducing all of the pillars were not very interesting and were all in fairly weak episodes overall. The only one that I thought was particularly good was Mistmane's and she barely does anything in the episode. In fact, none of the pillars aside from Starswirl don't really do much of consequence in the episode, who didn't have an establishing episode at all. I'll probably talk about the non-Starswirl pillars and their future in the show in-depth at a later date, but at this point I'll just say that most of the comic stories were better then the brief ones that we got in the show and I hope that they can build upon these characters in later seasons as they have interesting visual designs but at this time don't feel like they're really living up to their potential. It's nice to see some continuity through the season and have it build up to the finale, especially in a fairly unexpected way (or at least unexpected if you didn't read the description of the episodes) but I do feel like it could have been more interesting. It doesn't really feel like the finale builds upon those stories. Rather it just feels like they exist so when they showed up in the finale people weren't going "ok who are all these people?" A lot of the Mane 6 suffer similar fates as their ancient counterparts, especially once the plot gets rolling. The fetch quest in the first part seems to largely exist just so they have something to do, because aside from that all of them besides Twilight and Starlight do very little to actually impact the plot of the story. My favorite of the diversions is definitely Rainbow's. Garble was fairly fun back in Gauntlet of Fire and he's similarly amusing here. Also Rainbow just taking off with the shield rather then beating it from Garble in the race was unexpectedly funny. Rarity's was kind of silly, the caretaker had been watching over it for years and never cleaned it up? Or hired someone else to do it? AJ's feat of extreme strength was similarly immersion-breaking. 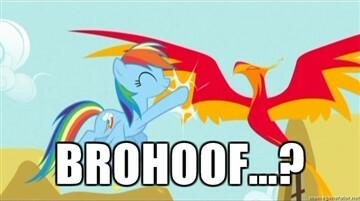 It was nice seeing Daring Do in Pinkie's one, and Fluttershy's was pretty unremarkable. As a whole the ordeal is too brief to really feel like gathering all of the items is much of an achievement and just feels like a diversion, although I suppose given how little they appear outside of the quest having the Mane 6 go on it is better then nothing. One thing I will say though with all of the Pillars is that it's really cool that they're actually delving fairly deep into the lore of the show. One of the things that I always really liked about the show is that there was actually a lot of worldbuilding that went into it and it's awesome that they seem to be focusing more on expanding it. Starswirl was always a character that I was hoping would eventually make an appearance in the show one way or another and so the idea that he might end up being a mainstay and play a significant role going forward has me giddy. The brief cameo with the Sirens was a fitting callback. And learning of the origin of the Tree of Harmony was neat too, and the explanation is pretty satisfactory. It's played such a central role to the show so far so finding out where it came from was nice. I just hope that some of this stuff can be followed up on. As I said before the Pillars weren't introduced in the best way and aside from Starswirl none of them really have much to do here, so I hope that later they can be fleshed out in Season 8. As for the main plot it's a bit predictable at times but overall I liked it quite a bit. The dynamic between Twilight, Starlight, and Starswirl is engaging and makes a lot of sense. Twilight's idolization of Starswirl is well-established and it builds off the portrayal that she had back in Royal Problem where she was extremely worried about Starlight challenging the Royal Sisters even when they had a problem. Starlight likely sees herself in Stygian and when Starswirl says that people like him are beyond redemption she fittingly takes it personally. It's also nice to see how differently Twilight and Starlight react around Starswirl as similarly to Royal Problem it does a great job at highlighting the differences between the two characters. And Starswirl is established fairly well as an elitist old magician that is difficult to impress and is reluctant to admit he's wrong. It's understandable why he would jump to the conclusion he did, although all the rest of the pillars not inquiring about it at all felt a bit weird. Maybe they all just decided to agree with Starswirl since he was the de facto leader. Bringing it back together it was fitting that despite Starlight spending most of the episode disagreeing with Twilight, when it came down to it she stuck by her and vouched for her effectiveness in helping people. Seeing Starlight rub it in that she was right to Starswirl at the end was pretty satisfying too. Unfortunately I feel like the Pony of Shadows was one of the weaker villains that the show has had. His visual design is fairly unimpressive. His backstory is interesting but we barely got to see any of Stygian before the transformation so hopefully we'll be able to see more of that in Season 8. Perhaps the biggest problem is that he never actually feels like a threat. Right off the bat he gets rebuffed by Twilight, and then when he tries to take her out Starlight helps and the two are able to handle him pretty effectively to the point where he runs away soon after. And during the final confrontation there's never really any point where it feels like the good guys have any remote chance of losing. He never really gets a chance to show off how powerful he actually is, rather we're just told that he's a serious threat. The only real tension is whether or not the ponies will have to give up the Elements of Harmony to stop him. Lastly personally his obsession with darkness and his voice make it extremely hard to really take him seriously. He doesn't do anything entirely wrong but at the same time he's never really gotten a chance to shine because he is barely even in the 2-parter and both times he appears he's instantly defeated. One last note about the climax, it's kinda weird that there's all of those characters there but the only ones that end up actually doing anything are Twilight and Starlight while everyone else just sort of stands there. Presentation-wise things are largely just adequate here aside from the fantastic opener. I really like when the show deviates and goes for alternate art styles, and it was cool to see here. Beyond that there were some memorable expressions but aside from that most of the shots were adequate but nothing spectacular, which is a bit disappointing because it is the finale and most of them have traditionally gone above and beyond in that department. Voice-wise the actor for Starswirl is pretty fitting and he pulls it off nicely. As I said before the Pony of Shadows was tough to take seriously, and Stygian was fairly unremarkable when he didn't have a massive filter over his words.The music at the beginning sounds like it's from somewhere. Was it already used before? As a whole the dynamic between Twilight, Starlight, and Starswirl was very interesting and that combined with all of the new lore made the finale enjoyable for me, even though there were a couple of more iffy parts, some of which were more or less unavoidable. Most 2-parters have troubles making just the Mane 6 all feel relevant, and this episode had 14 characters to worry about. It's inevitable that some are going to feel left out and the fetch quest attempting to remedy this a bit was a gesture that was at least appreciated even though it wasn't all that effective. If I were to rank it among the other Haber 2-parters I would put it far above The Crystalling but put it a bit below Cutie Re-Mark and To Where and Back Again. (Although it's worth mentioning that those two are among my favorite 2-parters that the show has had) I would say it was a satisfying ending to what has been one of the best seasons of the show, even if there were a couple issues with it. It’s pretty neato that the whole thing condenses like that. That way you guys don’t have to scroll past it. Oh! Condensed spoiler blocks are a game changer! Spoilers! Images! Anything's possible! Yeah I was thinking that some of my longer posts I could put under spoilers so it doesn’t take up as much space. Also a huge batch of images could be spoiled too. Would they have to load if they are initially spoiled or just when they’re revealed? Under a mountain of blankets. Send cute otters. I'm very privileged to be part of this amazing, loving community. Thank you all for helping to make this work. Glad to be here with you all, PonyERA! Look guys, we need some analyzing, and I'm not going to settle for a copypasted post from the last board. I shall do a deep dive into this extremely interesting piece of fan art. 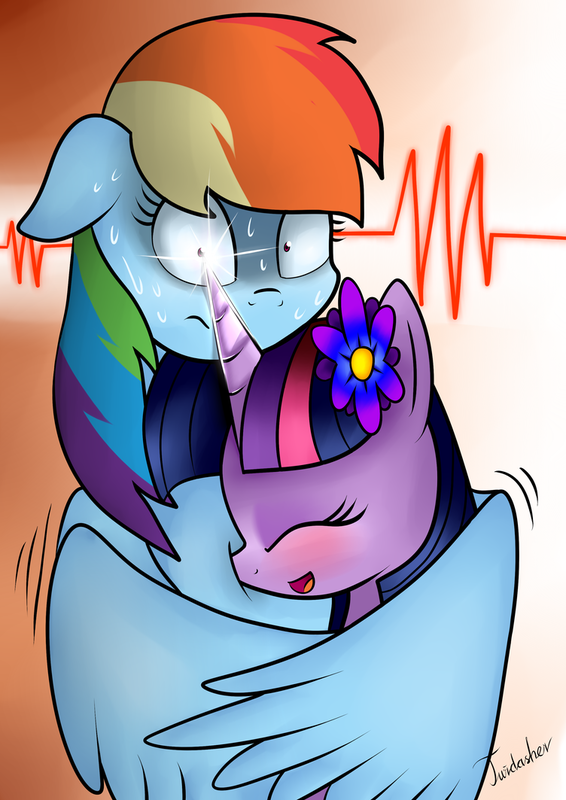 First of all, note the part where Twilight kisses Rarity's hoof. This is something that, among the Mane Six, can only be done with this pair of characters. Only Twilight would think that Rarity needs to be treated like a princess, despite being a princess herself, and kiss her that way so earnestly. And only Rarity would receive a kiss like that without a hint of awkwardness. Also note how they don't break eye content. In the second part, where Twilight flies and kisses Rarity's horn, note how Twilight goes out of her way to fly up, instead of forcing Rarity to lower her head. Something I didn't notice until I looked a couple of times is that Rarity's eyes sparkle during this, which combined with her smile, shows that she's quite smitten by Twilight's actions. Twilight kisses the tip because that's the most magical part. And of course, there's the kiss on the cheek, where Twilight specifically goes to the side where she won't have to move Rarity's hair, showing how deep their understanding goes. They close their eyes because it's cute. ... Yeah, just felt like doing something silly. Alright Mr Sigma, if that IS your real name. I will not stand idly by as you attack the character of my post with such haphazardness. It may be a cross post from a now-defunct forum, but it is the single most important piece of literature this fandom has ever seen. That post is literary perfection. In fact, the main problem is that it isn’t in more places. I’m calling my uncle that works for Hasbro to make sure that the opening of the show is replaced by that sacred text read aloud by Morgan Freeman. I will mark my full rebuttal as spoilers so its contents may trigger a reaction similar to the one the Nazis had at the end of Raiders of the Lost Ark by those with mere mortal eyes. First things first, I thought better of you Sigma then to put this monstrosity before me. I haven’t been this disappointed in something since I watched the My Little Pony Movie and saw that once again my precious Celestia had been kidnapped. The full body pillow of her that I brought with me cannot talk but if she could I’m sure she would agree with me. The art itself is a catastrophe of continuity. Every one of its frames betrays something established in the other two. Take the space between her foreleg and the rest of her body. 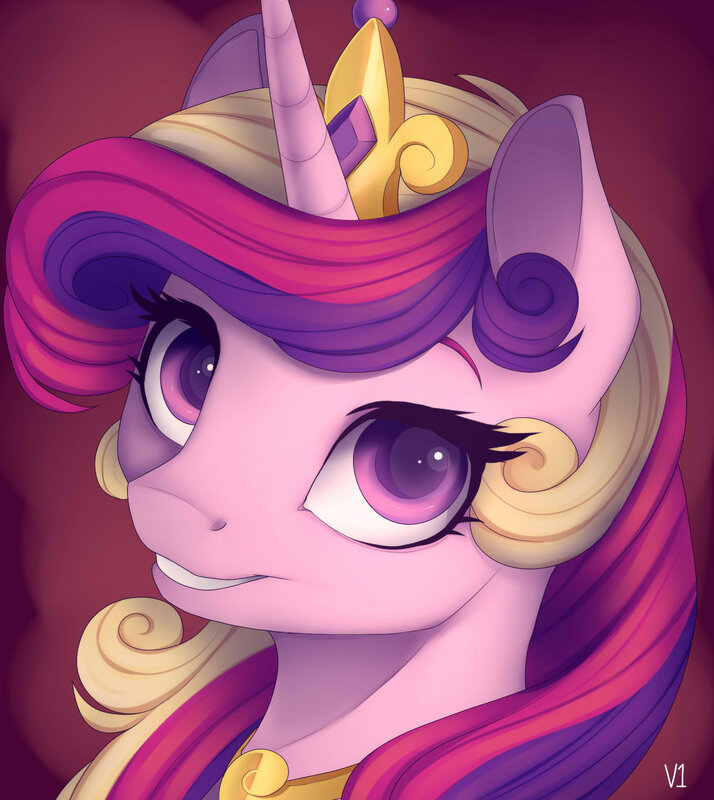 In two of the poses it matches the color of the background, but with the pose of Twilight kissing Rarity on the cheek the space matches the color of Rarity’s fur. 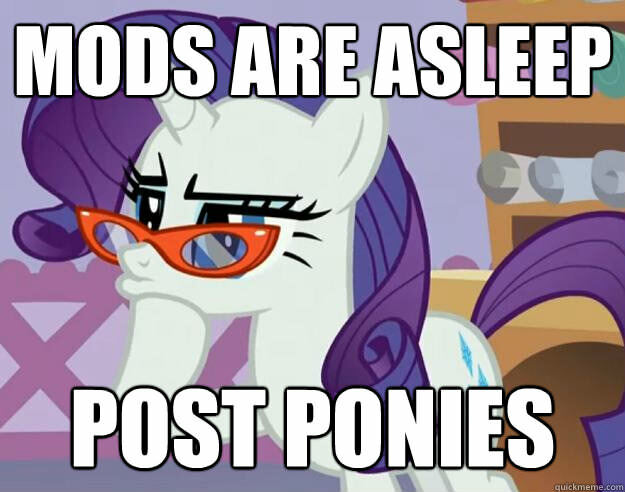 Take notice of Rarity’s hair curl. It changes color and shading every pose. As we all know the most legendary aspect of MLP is its attention to continuity. Any art that does not respect this may as well be posing on Lauren Faust herself. And speaking of continuity, what is this idea of Twilight hooking up with Rarity. She already has a love in Flash Sentry. But what’s more we know that if she ever returned to the world beyond the mirror she would no doubt be smitten by the very same man that stole the heart of her alternate self, Timber Spruce. And furthermore we know he would have a twosome (or rather a Twisome) with them. I hope this will prevent you from making as grave of mistakes in the future. Well if nothing else you certainly achieved that. And once again, thank YOU for enabling us all to be here together on Era. I don't like the bit where she kisses the horn, cos god dang that thing looks sharp. Regular unicorn horns have rounded tips. It's Celestia and Luna's horns that are sharp. Noticed the hair changing, but now I can't unsee the space between her legs changing color. And yes, show horns look safer and I suppose more kissable. By the way, I just realized we made a grave error with our return here, especially with the presence of people that haven't posted in a while: we didn't do pony rankings. I've always been a T-Sparks man myself, but I'm not about to throw the others under the bus. All ponies are best ponies. Doing rankings is hard. Most of the Mane 6 range from really fun to just kinda there for me. Before I would probably have put Fluttershy near the bottom but I’ve warmed up to her more recently. If I were to do a Mane 7 ranking..
My Little Pony? Really? Isn't that, like, for little girls? Forgot to say, hello to you too! Yes, and you were doing it while recovering from surgery! You really didn't have to do all that, but things wouldn't have gone as smoothly without you, A.M. I think a lot of the changes to Rarity were meant to be lighting changes from Twilight moving around. The gap is probably a case of the artist noticing the mistake but accidentally removing it from only two frames. A lot of people seem to tolerate Timber because he's with SciTwi and not PonyTwi, and didn't think he would actually show up again. I suspect hatred toward him will rise with the new online series, since the relationship is actually continuing. Yeah, unicorn courtship is really dangerous. The notable ones can kill you with magic if you upset them, and even when it's going well, you have to be careful hugging them.